Fillet of beef is the ultimate cut – lean but buttery-tender. Grass-fed and organic, it’s a show-stopper for a special occasion. 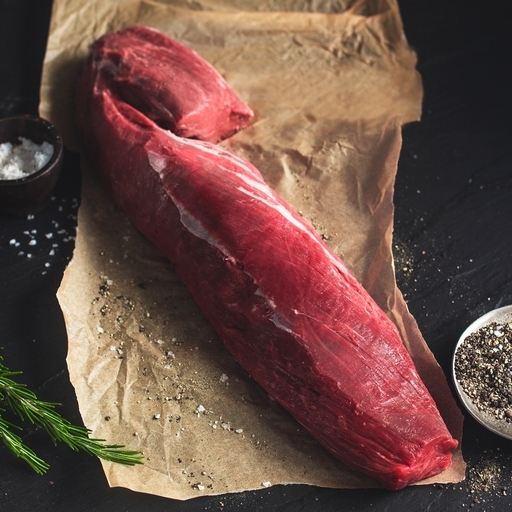 We keep it whole so you can prepare it just as you like – beef Wellington, wafer thin carpaccio, steaks cut to your perfect thickness or diced for a succulent stew. Serves 4-6. Remove from the fridge 30 mins before cooking. Preheat your oven to 200˚C/Gas 6. Season and oil generously. Brown well in a hot frying pan on all sides, including the ends. Transfer to the oven and roast for oven for 20 mins for medium (add 10 mins for well done). Wrap in foil and leave somewhere warm to rest for at least 15 mins before carving. Use any resting and roasting juices as the base for your gravy.